I am thrilled to announce that I will be directing one of the pieces of LONG DISTANCE AFFAIR that will première on October 24th in Queretaro, Mexico. PopUp, the new theatrical production company formed by Tamilla Woodard and Ana Margineanu are very happy to start preparing a new edition of LONG DISTANCE AFFAIR and they have invited me to be part of this exciting project. LONG DISTANCE AFFAIR explores the question: “What can you get from one person when all the information you get comes through a computer screen?”. LONG DISTANCE AFFAIR is a one of a kind theatrical event: an on-line show for an audience gathered in one place with performances given by actors spread out around the world. The show itself is planned to take place around the world, but the Mexico audience will view it via Skype. Each audience member is assigned a computer with a ready made connection to one actor located in, let’s say… Paris. The actor will perform a 9 minutes interactive show for this single audience member. When this show is concluded, the audience member will move to another country (computer). There, the audience will find another actor from let’s say… Hong Kong. PopUp pairs each director with a country, an actor and a playwright. Each play will be created specifically for that country and there will be actors from 5 different countries as the US will have two representatives. In my team, the talented Mexican playwright Mariana Carreño King and the great actress from Navarra, María José Doiz, member since 1998 of (As de T, teatro). I can’t wait to start working with them. Both me and PopUp share the same interest in the collaborative side of this project and how different theatre makers from different cultures work together. We hope you will find this way of work as exciting as we do. 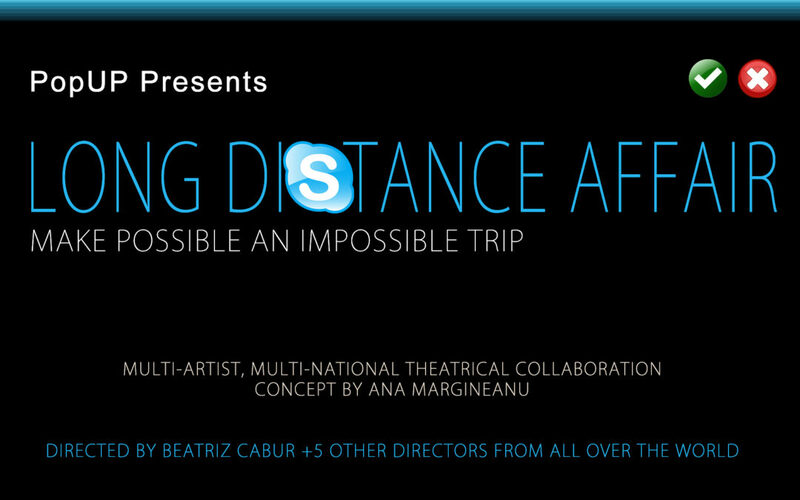 Check out the first edition of LONG DISTANCE AFFAIR which premiered in New York City on November 12, 2011, here.